Kyrgyz people cherish their nomadic traditions. Although these days they do not live in yurts year-round, many Kyrgyz families set off to high pastures and erect their yurt as a summer dwelling. Even in villages, families may assemble a yurt in their backyards during summer as a family gathering place. 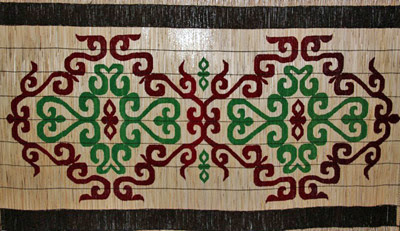 Functional mats and screens, known as chii (also spelt as chij) are an integral part of yurt construction and decoration. Chii are made of sedge, which grows in the foothills of the Kyrgyz steppe. The screens are used to cover a yurt's wooden frame. If the weather is very hot, then the outside felt covering is removed and the chii screen permits cross breeze through the yurt: nomadic air-conditioning. Chii screens are also placed over the felt covering to protect it from being blown off in windy weather. Chii mats are put under ala-kiyiz and shyrdak (felt carpets) inside yurts to protect them from dampness and wear and tear. Patterned chii mats also serve as partitions to separate the kitchen area of the yurt. After gathering chii, women clean and straighten it, compose a pattern then create that pattern by pricking the reed with a pin. 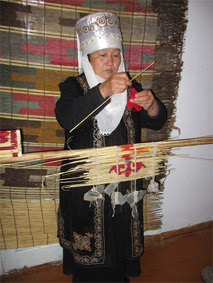 Then they prepare coloured wool according to the planned composition and braid each reed, so that when connected the reeds produce the harmonious pattern. A special loom is used to braid the reed. It is made of two vertical poles tipped with brackets on which a horizontal pole is attached at a height suitable for people to work standing. The woollen threads are thrown over this pole; the ends of the threads are wound over stones which function as loads. There may be about 20 – 30 such loads placed at a distance of 10 – 15 cm from each other. The patterns are not simply ornamental, they also invoke magical forces to protect against the evil eye or to promote well being. Stylised floral and animal patterns may also be braided onto the chii. At Bishkek's State Museum of Fine Arts an exhibition of chii by Nurbek Jolbunov was held in June 2013. 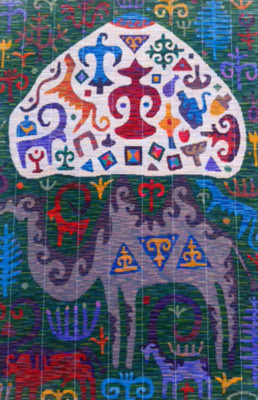 Mr. Jolbunov reinterprets ancient Kyrgyz patterns in contemporary chii. His exquisite pieces are keenly sought after by collectors. He works in the remote village Kulanach in the Naryn region and draws on the landscape and tales of his ancestors to produce his chii. On the 2nd floor of the State History Museum, there are some excellent samples of Kyrgyz chii. And in a Bishkek bric-a-brac shop I saw a marvellous chii with Lenin's famous profile braided into the reeds.